Earlier I blogged about ceramist Cornelis van den Abeele (†1731) and his brother Johannes. Cornelis’ wife was Maria Jans Vree (†1728). At the baptism on October 21, 1710, in Delft, of one of their children named Marija van den Abeele, one of the witnesses was Maria's sister Pleuntje Vree. Pleuntje Vree also witnessed the baptism of 3 children of Jan Pietersz. van Dalen and Neeltje Jans Vree. Pleuntje, Neeltje and Maria Vree were daughters of Jan Vree (†1680) and his wife Lijsbeth Oosthoeck (†1726). Jan Vree had died in November 1680, and Lijsbeth’s mother had married Cornelis Ariens Spanjersberch on October, 7, 1685, in Delft. As a widow Lijsbeth Oosthoeck owned some real-estate at the corner of the Turfmarkt and the Gasthuijssteeg in Delft. She survived her 2nd husband, too, and was buried on 10-7-1726 near the Old Church in Delft. Pleuntje Vree was baptized as “Aplonia” on December 24, 1662, in Delft. There Pleuntje had been married, on June 6, 1688, to plate painter Franck Pietersz. van Dalen who was living at the Nieuwe Langedijk. Franck was a son of Pieter Rutten van Dalen and Pieternelle Vranke Voorstadt who were married on February 2, 1663, in nearby Schipluiden. Franck was baptized on March 3, 1665, in Delft with witnesses Ruth Janse van Dalen and Claasge Arijens (who were likely his paternal grandparents). Pleuntje's sister Neeltje's husband Jan van Dalen was another son of Pieter Vree and Pieternelle Voorstadt. Pieternelletie van Dalen, bapt. on April 17, 1689, in Delft with witn. were Pieter Rutse van Dalen (paternal grandfather), Pieternelle Franke Voorstat (paternal grandmother) and Neeltie Jans Vree (maternal aunt). One of the children of ceramist Frank van Dalen was buried op October 8, 1697, near the Old Church, possibly Pieternelletie. Jan van Dalen, bapt. on October 24, 1690, in Delft with witn. Cornelis Spanjersberg (maternal step grandfather), Lijsbet Jans and Hester Pieters. Pieter van Dalen, bapt. on August 28, 1692, in Delft with witn. Pieter van Dale (paternal grandfather) and Ester Pieters. Pieter was married to Magdalena Thoen / 't Hoen. They had a daughter Apolonia bapt. on August 18, 1715, in Delft, with as witn. the paternal grandparents Franck van Dalee and Aplonia Vree. They also had a son Franco bapt. on October 26, 1721, in Delft. Magdalena ’t Hoen, wife of Pieter van Dalen, living in the “Gasthuislaan bij het Oosteinde” was buried on Ocober 30, 1736, near the Old Church. At the time they had 1 adult child and 3 under age children. Lijsbet van Dalen, bapt. on October 10, 1694, in Delft with witn. Knelia Spanjersberg and Lijsbet Oosthoek (maternal grandmother). She was the widow of Lucas Pietersz. 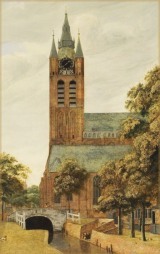 van Son when she was buried on November 18, 1779, in the Old Church in Delft. Markus van Dalen, bapt. on October 14, 1696, in Delft with witn. Pieter van Dale, Pieternelle Vranke (paternal grandmother) and Aaltie Vree (aunt). Pieternelle van Dalen, bapt. on May 24, 1699, in Delft with witn. Pieter Rutte van Dalen (paternal grandfather), Hester Pieters van Dale (paternal aunt) and Pieternelle Vranke Voorstat (paternal grandmother). Pieternelle was likely buried on April 8, 1741, near the Old Church, after having been married twice. Jan van Dalen and Neeltje Vree had at least 6 children. Neeltje Vree, widow of Jan van Dalen, living at the Langendijk, was buried on May 10, 1751, near the Old Church in Delft. “Appolonia” Vree, housewife of Frank van Dalen, was buried on November 18, 1718, near the Old Church. Franck van Dalen may have been buried there on January 3, 1729.